“The combination of easy access and nice alpine makes Brandywine a good last-minute weekend destination. My Xterra made it to the 4wd parking area with no problems. The trail through the meadows has been upgraded and now there is very little mud. We left the valley before the end went south up to the ridge where we scouted out camping locations. From our vantage it was fun to watch different groups take various routes up the mountain. They all looked like coloured ants. In the evening we made a good firepit and soaked in the superb star show. “Well, I did this callout with the wrong date on it, which made me very upset when I realized it that morning. Luckily Alena K somehow made the same mistake and also thought the trip was for that day so we actually did get to go! I was surprised to discover that since I had been there last, there is a 4×4 road that takes you basically right to the meadows. If you don’t have a 4×4 you can park at the lower lot and make the 3 km hike up to the meadows. We had a fantastic day at Brandywine. It was 34.5 degrees that day and we couldn’t have chosen a better location for a hike in a heat wave. There are streams EVERYWHERE! So much splashing! I even had a swim in the tiny, icy lake half way up to the ridge. Also, the mega bug situation that occurs up there was pretty mild on this day. Our first attempt to gain the ridge was on the talus slopes to the north side of the headwaters. 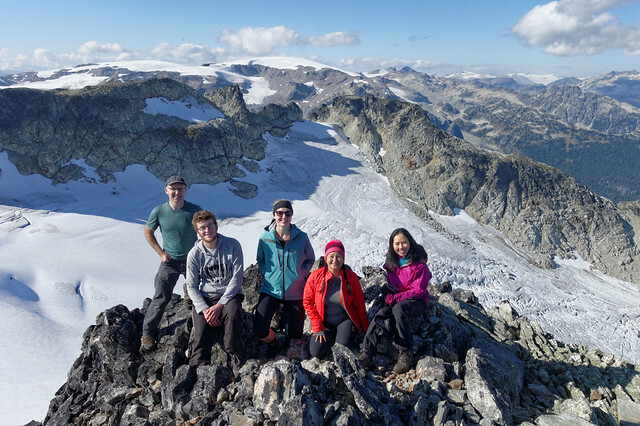 We found a beautiful area overlooking the meadows and great views of Garibaldi but to get to the ridge there was a snowfield crossing that looked like a death trap that we quickly decided against. We descended again to the headwaters to cross over to the western side and finally made it up to the ridge. The view from even just the ridge is breathtaking. We chose not to go to the summit of Brandywine in order to avoid a darkening drive down the FSR. No regrets though. That view was fantastic. I am eager to go back and do more exploring along those ridges up there and hit the summit. I loved this hike!